I was able to pick up my needles this week but quickly realized that I was going to have to find a sweet spot to appease both of my hands. This gave me the best excuse to cast on several projects, I mean, I have to keep my hands happy! 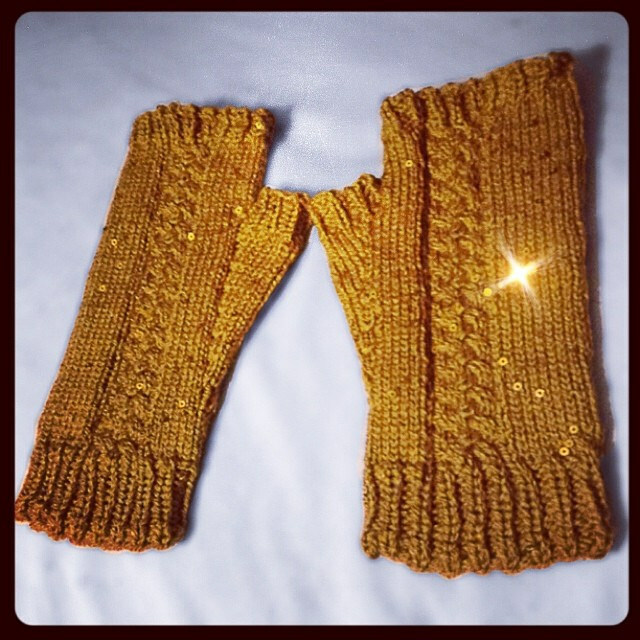 I casted on another pair of these immediately after I finished the first, I am only on the ribbing so no picture yet, but they are fantastic to knit and easy on both hands. 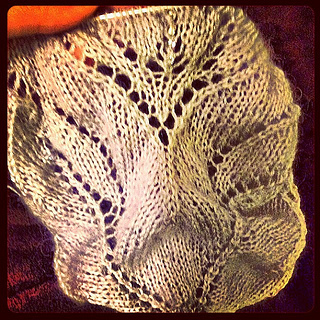 This pattern is from the Craftsy Class New Directions in Lace. It is an incredible early Christmas present from my Mom – and there are beads! I am still a bit daunted by how much work it is going to take to finish this beast, but it’s just so pretty I don’t care. Romi Hill creates the most beautiful work and her class is so full of information I’m surprised it didn’t cost more. 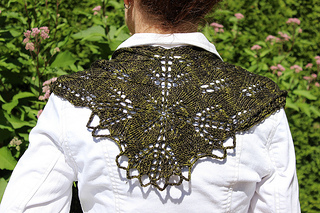 If you like lace, like learning, want to try something new and work with a stellar pattern – go sign up for this class. Yes. I am scared to take off the belly button cast on. I have gone on a mini design kick trying to make a bunch of different beanies. I am trying to have a very styled brim (usually combinations of stitch dictionaries) and working my way through a list of hat decreases. 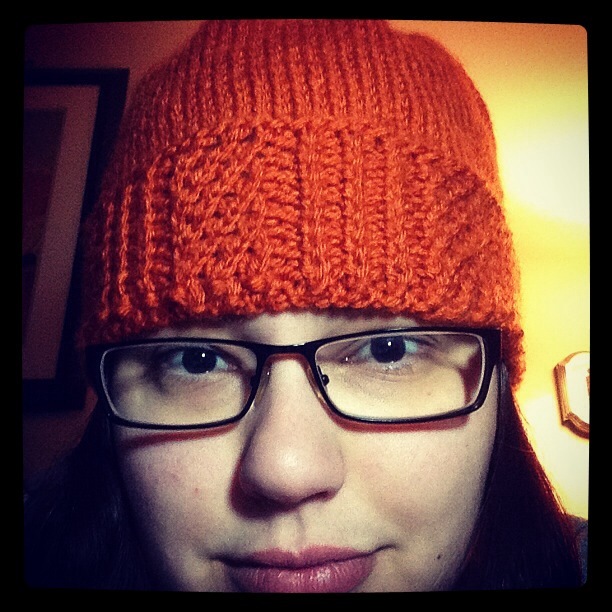 I just finished the one last night, the rusty orange beanie above ↑ so I will need to cast on another one today. 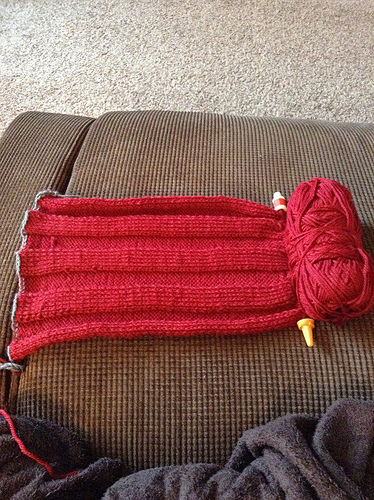 Total length needs to be 44″ – still a bit to go. Oh! For fun, here is Lucy Neatby showing the coolest provisional cast on I have ever done. 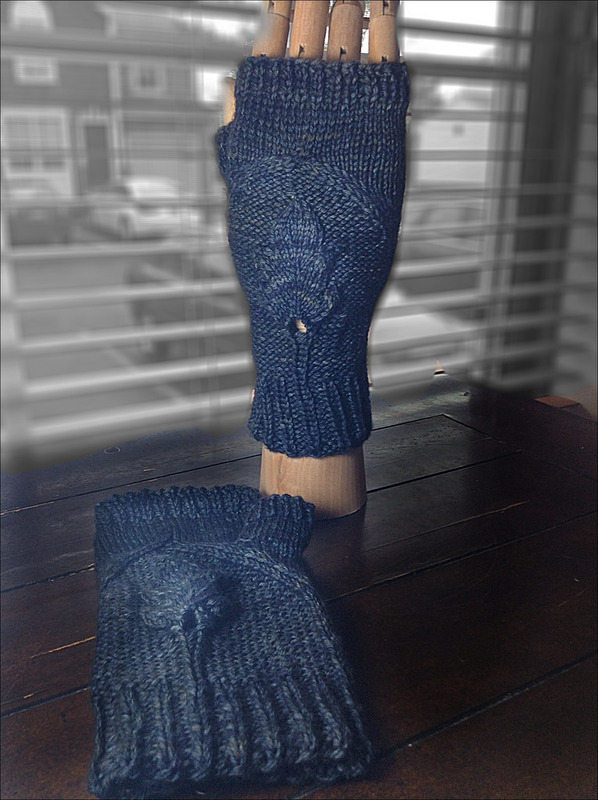 This was another attempt to create something out of my own noggin….and some stitch dictionaries. I am trying to combine different variations on eyelet patterns so it looks swirled. I started it before I hurt my left hand so I can only work on it maybe 20 minutes a day. The color is beautiful though so I don’t mind looking at it everyday. So that’s the low down on my WIPs for Wednesday. I hope you’ve enjoyed my ranting and hopefully I have given you an excellent excuse to cast on more projects – you must think of the health of your hands! So friends and neighbors I am interested to hear, if you would like to share, how you combat both boredom and hand fatigue. 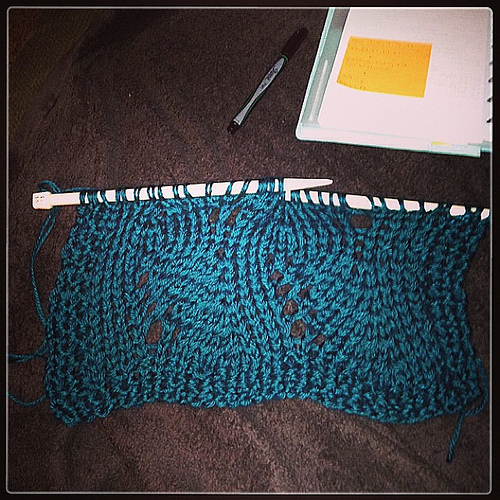 I was once a fairly monogamous knitter (no more that three projects going at a time) so this is all new to me. Feel free to share – I love to listen! This entry was posted in Blogging, Don't Tell Me What I Cannot Do, Etsy, Happy Place, Instagram, KAL, Knit Along, Knitting, Photographs, Ravelry, Yarn, yarn stash and tagged beanie, craft, craftsy, custom designs, design, diy, etsy, fiori autunnali, FO, friends and neighbors, hat, jayashri pullover, KAL, kalAllNight, knit, Knitting, lace, musings and motion, Patons, pattern, romi hill, shawl, socks, support small businesses, sweater, WIP, yarn, yarn stash on October 23, 2013 by allnightknits. 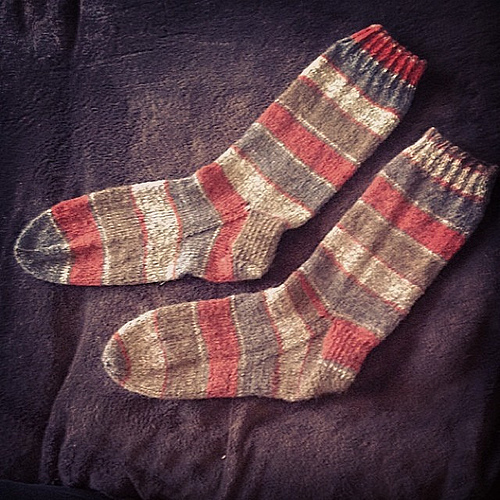 I just finished my first pair of knitted socks. Size 2 DPNs – EAT MY DUST! 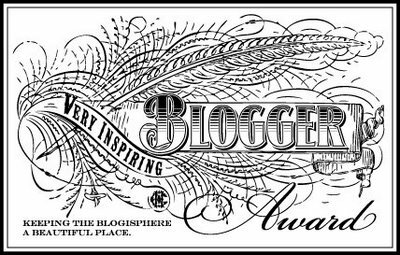 I thought this would be a good way to come back to my blog, to show some massive progress has been made. It wasn’t made in the week (5 days – Trevor would have added this here so I am going to add it for him) I took off but in the past two years. Two years….that is still really hard for me to wrap my head around. Two years ago, from April to October I 1) lost my grandfather 2) lost the idea of motherhood and 3) loss all functionality in my hand. I was down, I was so down I didn’t even realize it. I couldn’t write, drive, eat, lift, get my hair clean, put in my contacts or give the finger in traffic – and I was told it was never going to change. 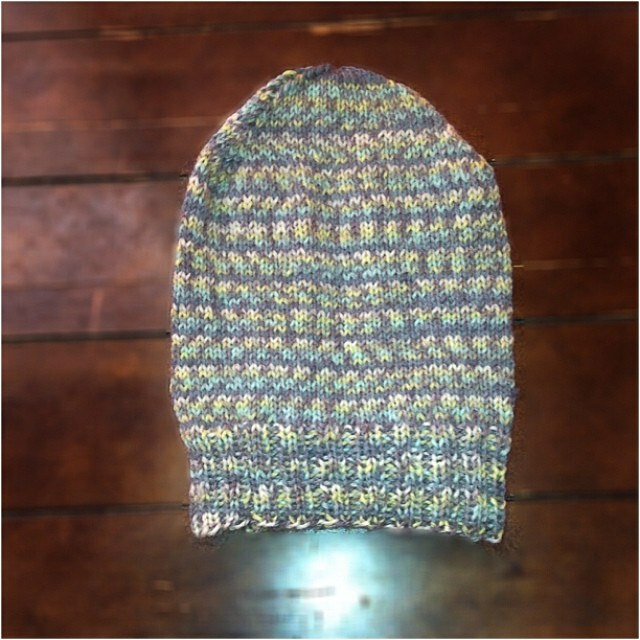 I saw a knitting pattern by Tiny Owl Knits – the Orchids and Fairylight’s hat – and I knew I had to figure out how to knit that damn hat. It took three very long months of practicing calligraphy to learn to write again, another two months to figure out how to hold my needles (and write legibly and consistently). 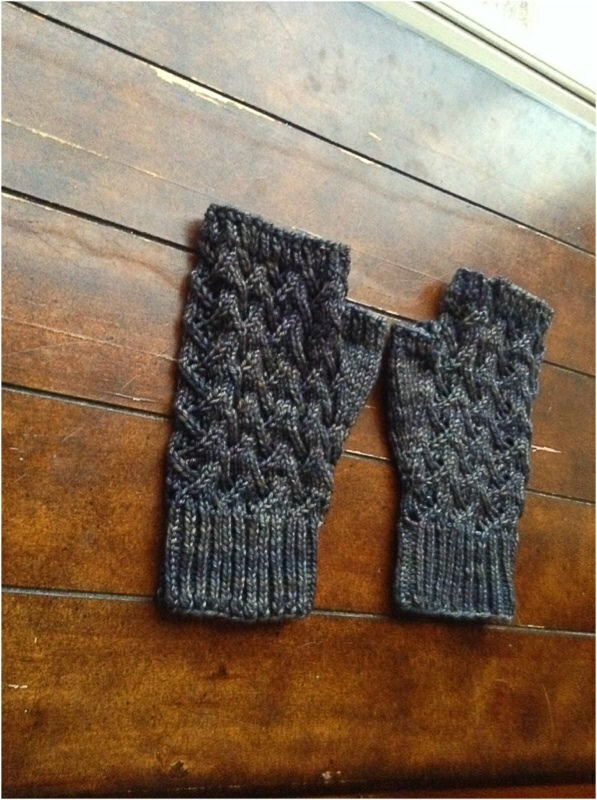 I found an amazing woman who showed me I didn’t really need more than seven working fingers to knit. 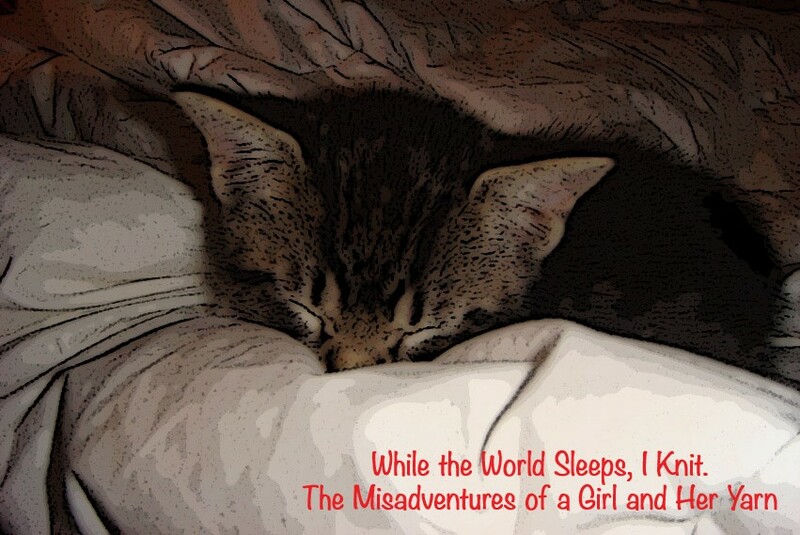 She spent two days a week with me in the public library going over everything I thought I had already learned. 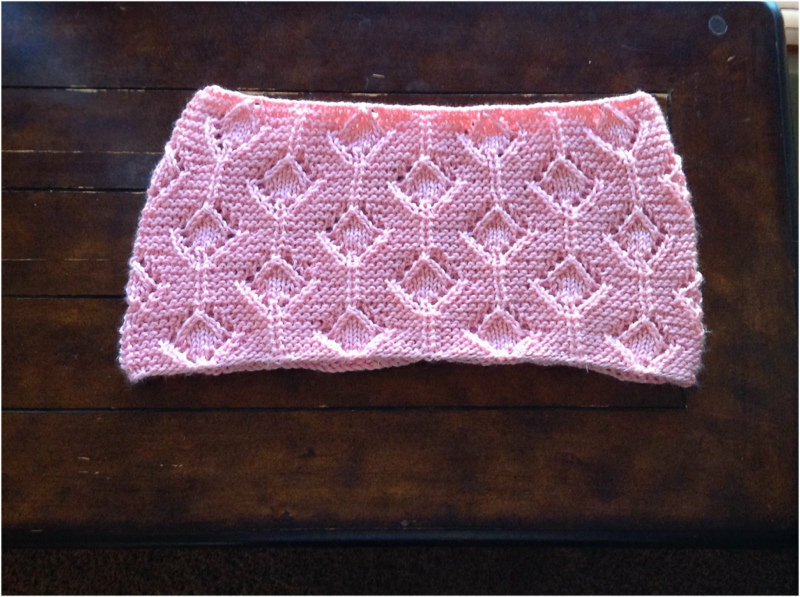 She gave me swatch patterns to work on, made me write out my GG’s patterns then knit them. She built up my confidence far more than she built up the muscles in my hand. 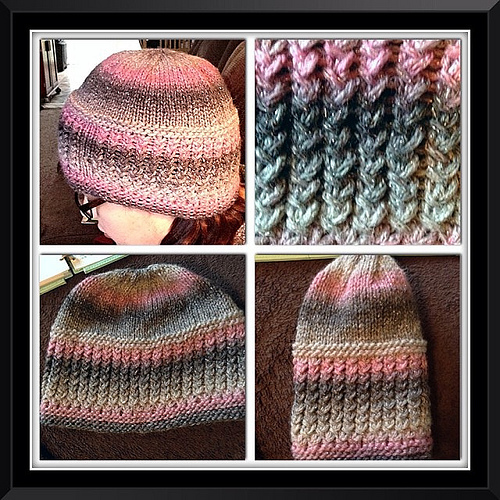 A year later, I finished my hat. 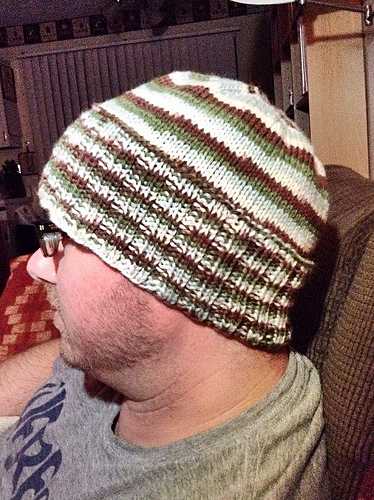 It took 4 months of monogamous knitting but I did it. It’s been a week and I am ready to come back, my right hand is still a bit sore but my left is totally healed. I can look down at the stupid appendage, all swollen and purple, and feel nothing but grateful. My hand works as much as I need it to, and I will have to learn to treat it a bit better. 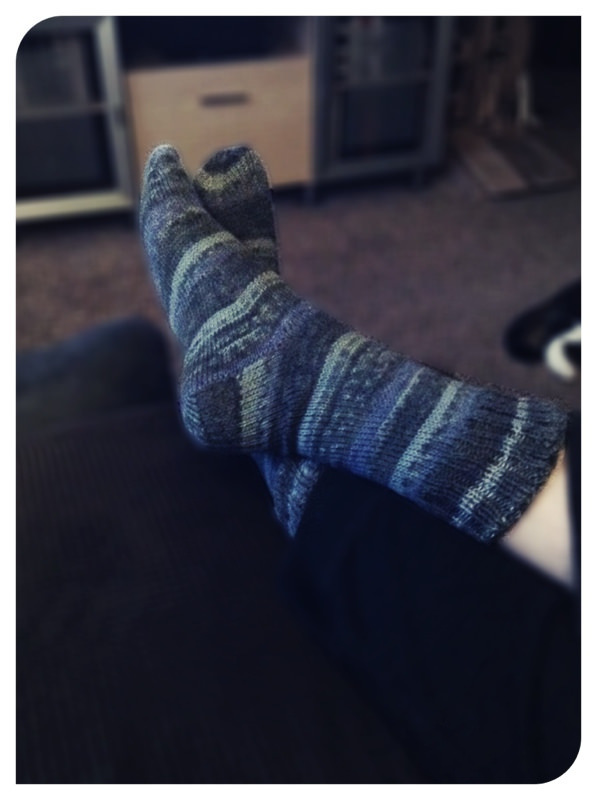 For now, it is 36º in the Buckeye State and I am curled up, wearing my new hand knit socks. 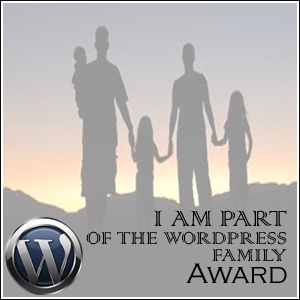 And friends and neighbors….that’s pretty awesome :). This entry was posted in Blogging, Don't Tell Me What I Cannot Do, Happy Place, Instagram, Kindness, Photographs, Ravelry, Yarn and tagged acceptance, accomplishment, Arthritis, beanie, change, craft, diy, hat, knit, Knitting, orchids and fairylights, socks, support, Tiny Owl Knits on October 21, 2013 by allnightknits. Photo Heavy Custom Order Progress! This order came in from a nurse who works with my Mom. She is a hunter who wanted 1. Something warm 2. Something aqua (I suppose so she won’t get confused for a deer) and that was all….the design was all mine! Now the pictures are not great….or even good, but I had to do a quick job so I could get it to my Mom’s and out for delivery. 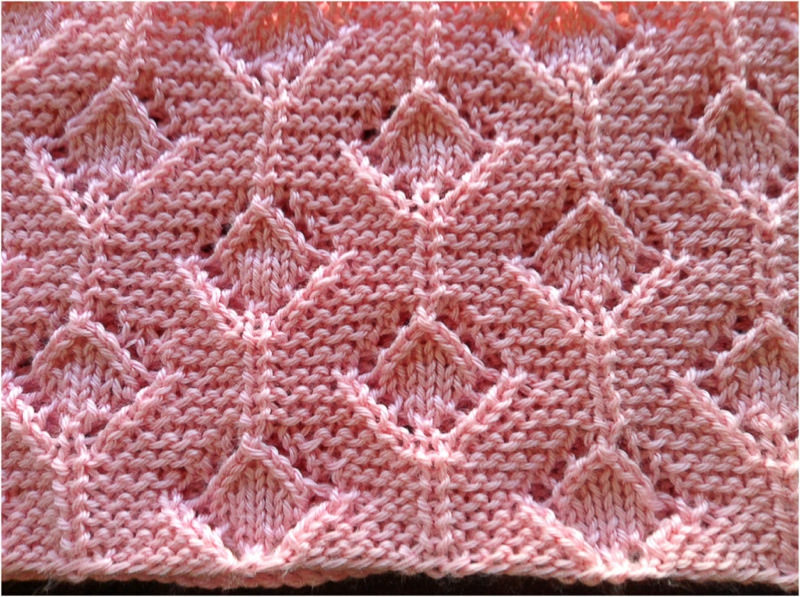 The stitch pattern makes it look like rib on one side and a basket weave on the other. 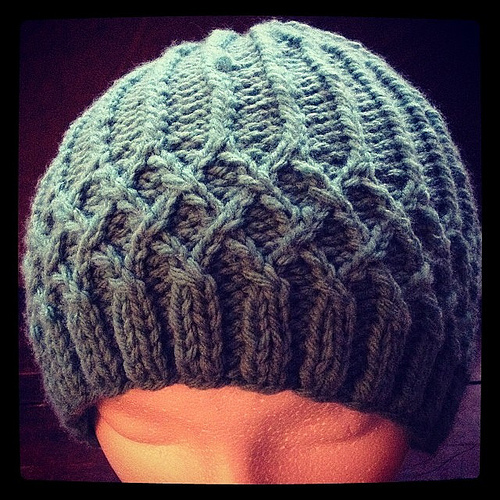 Simple and fun, easy to knit and super easy to memorize. Which is great, because it was about 82″ long. 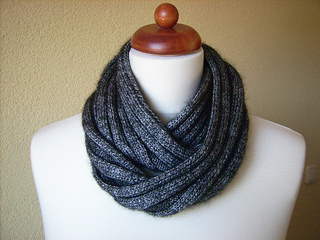 So I found the idea for this pattern on Ravelry, it’s called Claudia and it was perfect. I just decided that I wanted to make it mine. 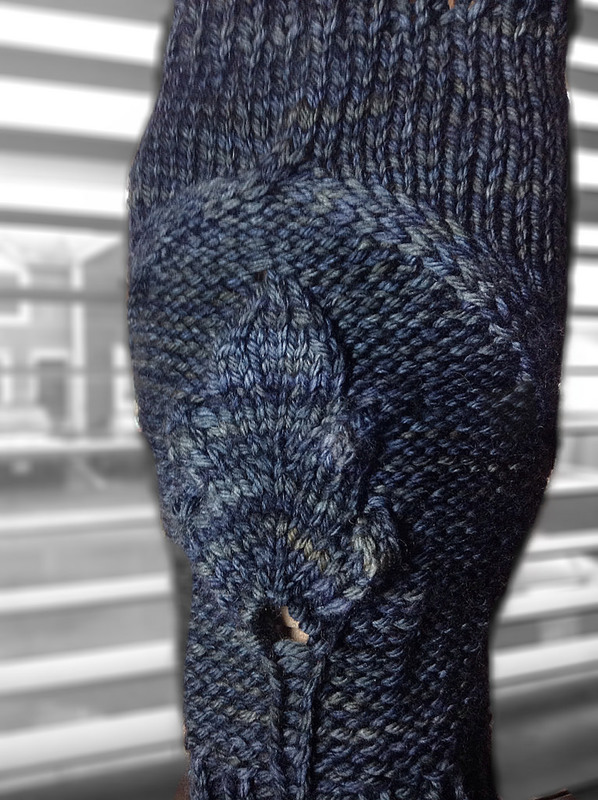 I changed the cast-on edge for the ribbing. I elongated and doubled the band so it was super thick, gotta stay warm for hunting. I kept the trellis cable the same but again elongated the body by about another inch. The customer (I need to call her something else, customer sounds sooo pretentious) has a lot of hair and needed a hat that would fit over her hair being pulled up. 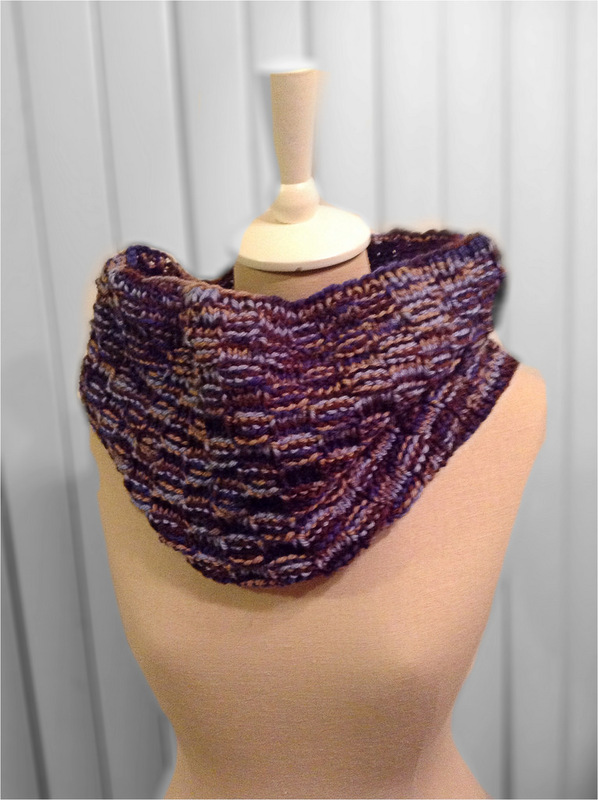 To finish, I did a super long decrease – adding another inch and changing the stitch pattern for the finishing. It looks a little silly on the dummy head but it fits like a dream! I am really happy with how it turned out. It hadn’t had a bath or been blocked when I took the pics, I did that my Mom’s house, but you get the basic idea. 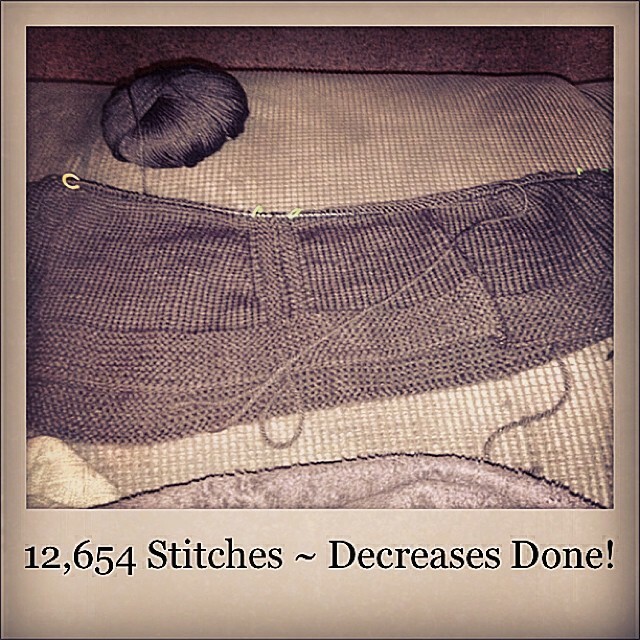 It blocked out far less pointy and the stitches really popped when it was stretched. 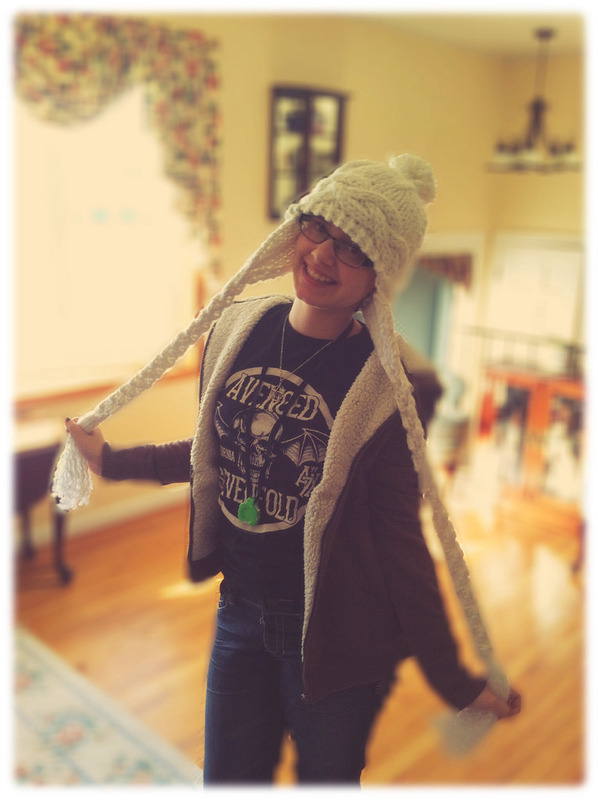 I tried on the hat before I washed it and I will most assuredly be making this for myself in the near future. 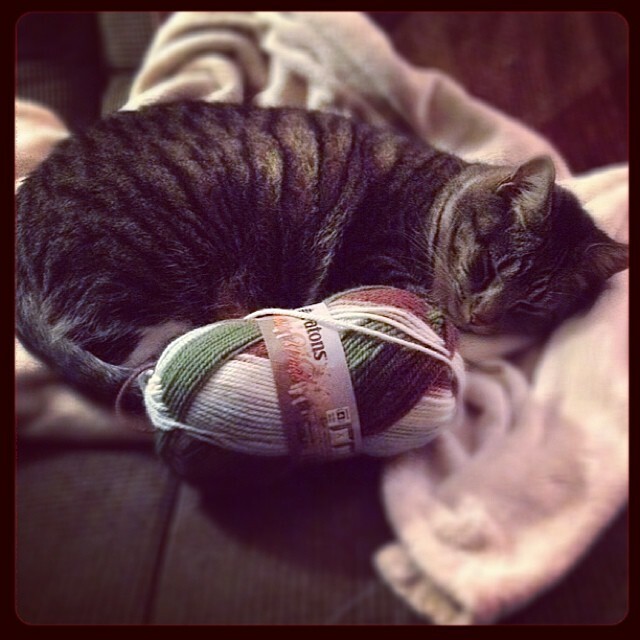 So that’s it for me friends and neighbors, how about you….any projects you are just dying to get on your needles/hook/sewing machine/ etc.? I want to hear! 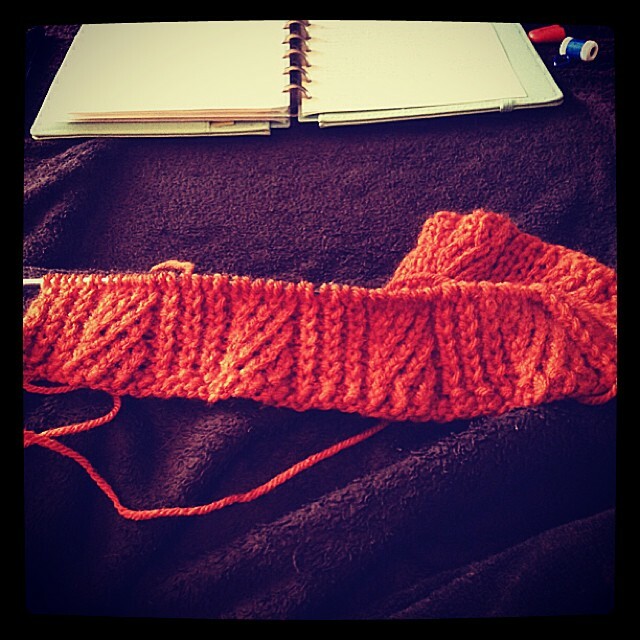 This entry was posted in Blogging, Etsy, Happy Place, Instagram, Kindness, Knitting, Photographs, Ravelry, Yarn and tagged beanie, cabled, cables, custom order, design, hat, instagram, knit, Knitting, progress, reversible scarf, scarf, support small business, trellis stitch, work on October 9, 2013 by allnightknits.